Spring has finally arrived in Edmonton and seeing that I had a week off due to March Break (the benefits of following the school schedule), I had the chance to wander over to the new Ritchie Market. It's super close to where we live now and the day was perfectly sunny for exploring the neighbourhood. 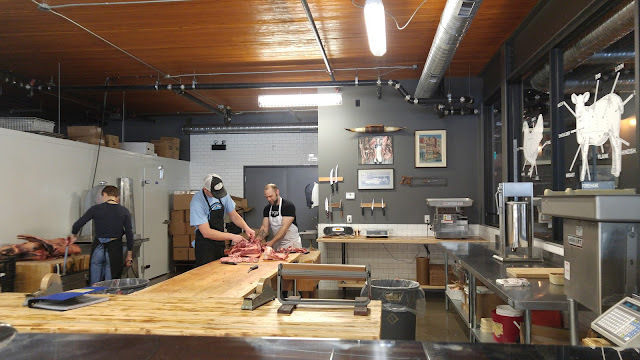 Ritchie Market also happens to house the butcher that we frequent- ACME Meat Market. 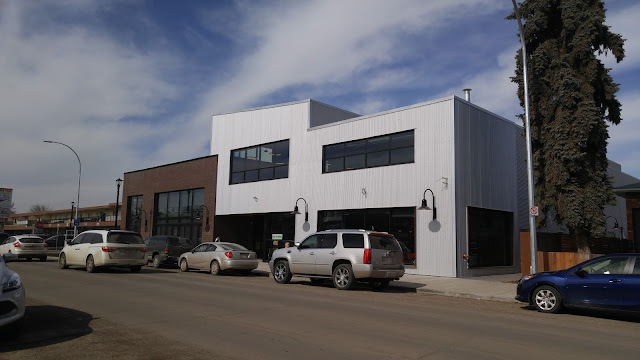 They had just moved into the new building last week, so I was excited to check out the new space. Upon entering Ritchie Market, you will find ACME located at the back of the space. 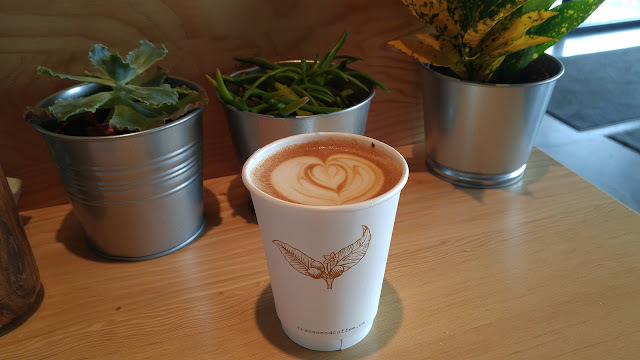 You could make a bee line straight to ACME or take your time enjoying the space by getting a coffee first at Transcend Coffee. One of my favourite cuts of lamb is the lamb chop steaks which Corey not only introduced us to but cuts the best lamb chop steaks by far. 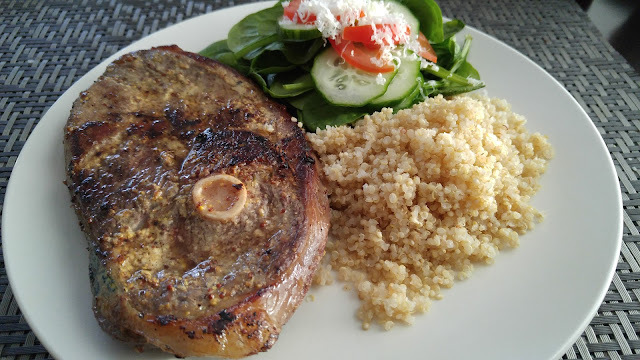 I love the fact that there is a substantial amount of lamb meat surrounding the bone with marrow so eating it is not only easy but extremely satisfying. 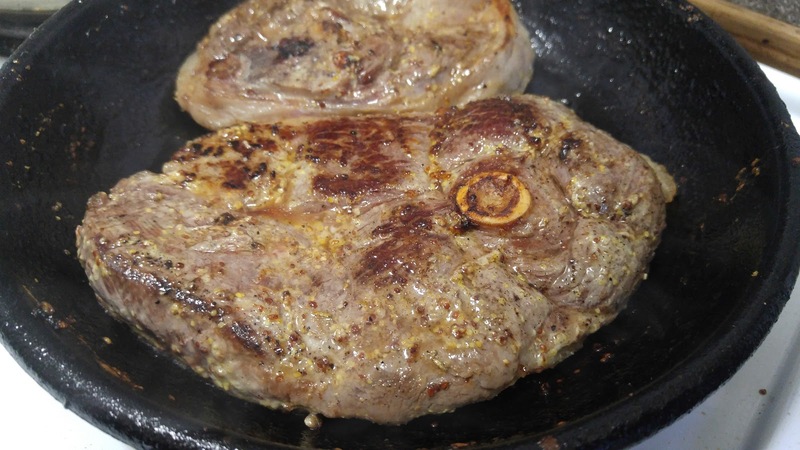 I was always a bit hesitant to cook lamb but in steak form, they are really easy to cook on the BBQ, oven or stovetop. Here you can see how large the lamb chops are. I had asked for a bigger chop and a smaller chop to be wrapped in a package to help with portion control. Each steak is as wide and long as my hand! Dan has been loving the method of reverse searing which I have found to be phenomenal. The meat is still juicy, the flavours are great because the meat is slowly brought to temperature and the lamb does not taste "gamey" at all. 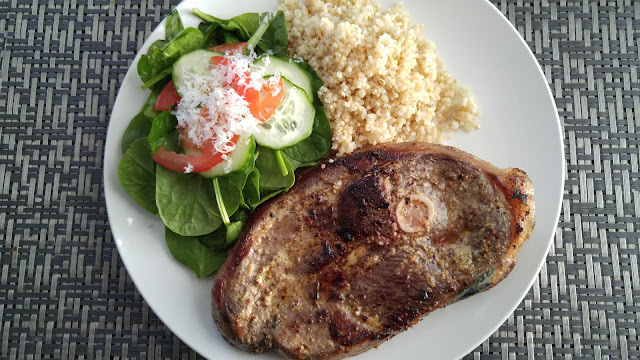 Here is our recipe for lamb chop steaks using a quick mustard marinade. Preheat oven to 250F. 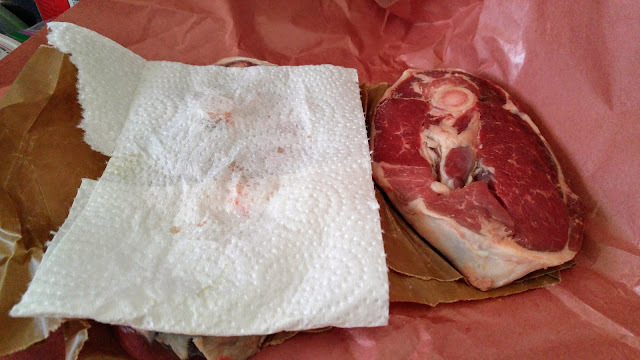 Using paper towel, pat dry each lamb chop steak on both sides. Lightly sprinkle kosher salt on both sides of the lamb chop steaks. In a food processor blend the olive oil, mustard, garlic, dried rosemary, pinch of salt and pepper. 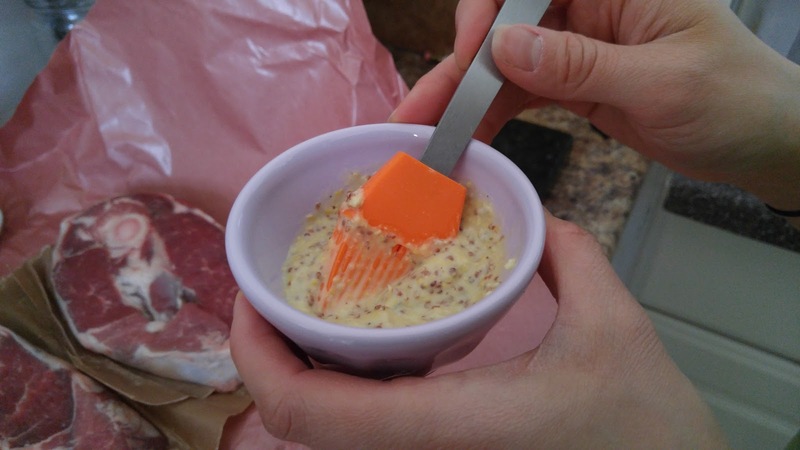 Lightly spread the marinade onto the lamb chop steaks. 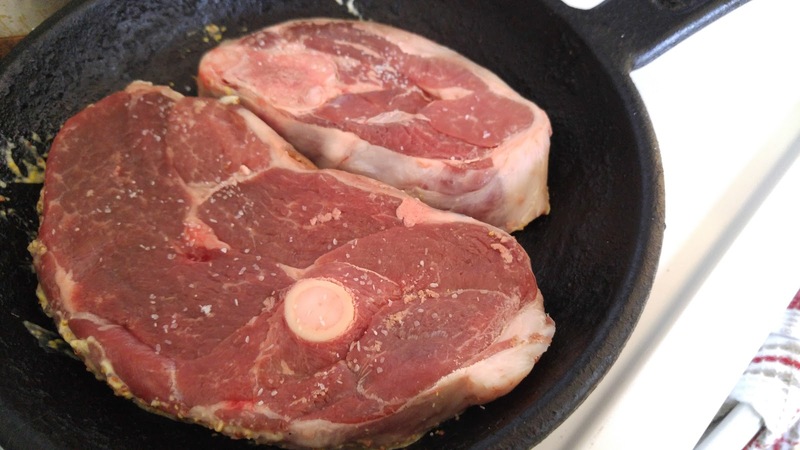 Transfer the lamb chop steaks into a cast iron pan or a oven safe roasting pan. 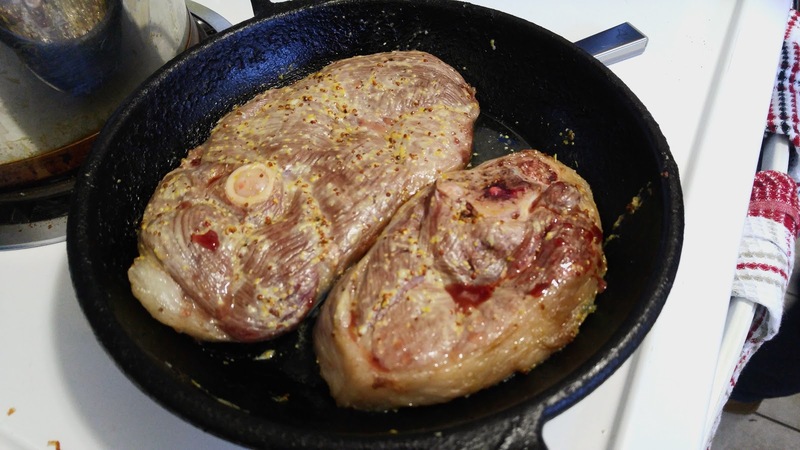 Brush the marinade onto both sides of the lamb chops. Place the pan into the oven and cook at 250F for 50 minutes. 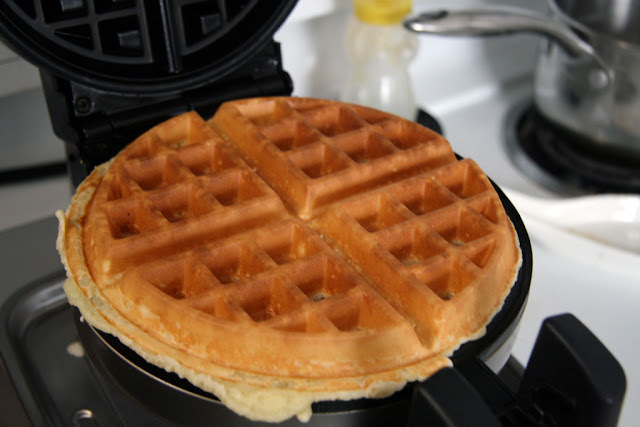 Using oven mitts, carefully pull the pan out after 50 minutes. 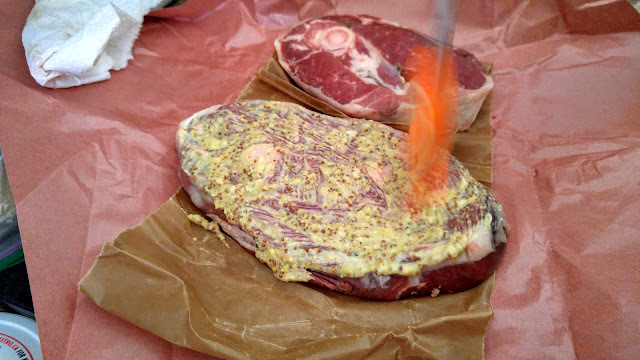 Use a meat thermometer to check that the internal temperature is around 140F. 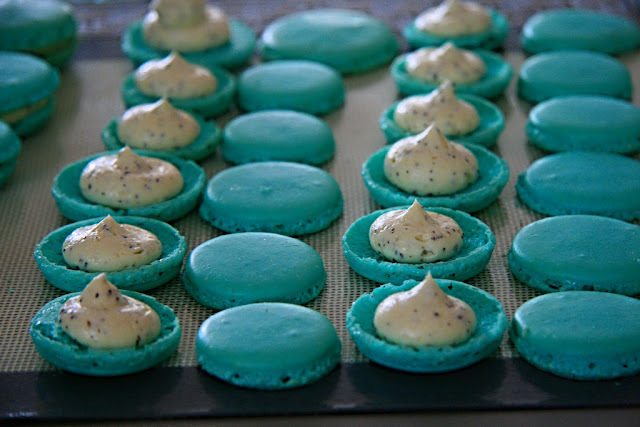 They might look uncooked at this stage even a slight grey-ish tinge, but don't worry as the next step will help finish them. Brush another layer of marinade onto the lamb chop steaks and then quickly sear them on the stove top at medium to high heat for about 1 minute each side or until it has a good crust. 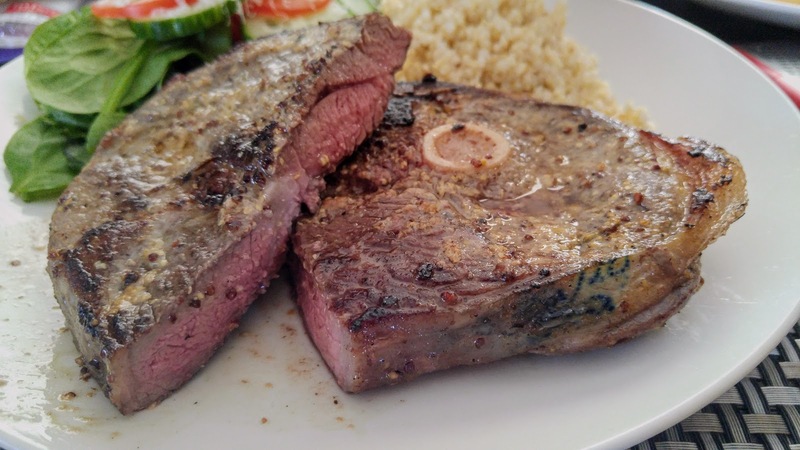 Transfer the lamb chop steaks onto a plate and cover with another plate. Allow them to rest for about 10 minutes. This helps to keep the meat juicy. Assemble the rest of your meal and enjoy! We tend to eat our meat at medium rare. 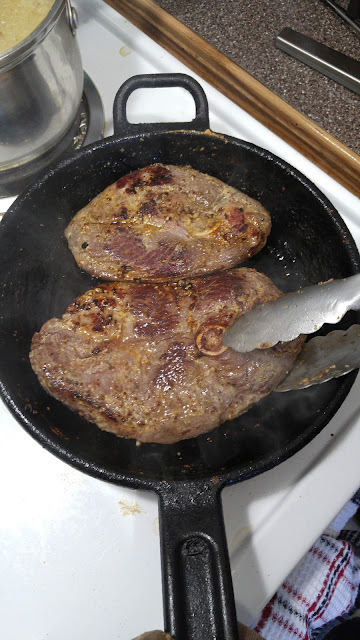 So if you are wanting more of a medium doneness, cook the meat for a tad longer in the oven (approx. 2-5 more minutes) before searing on the pan. With reverse searing, you have more control over the doneness since the baking time is longer and have less worry about timing the steaks instead of just pan-frying them. 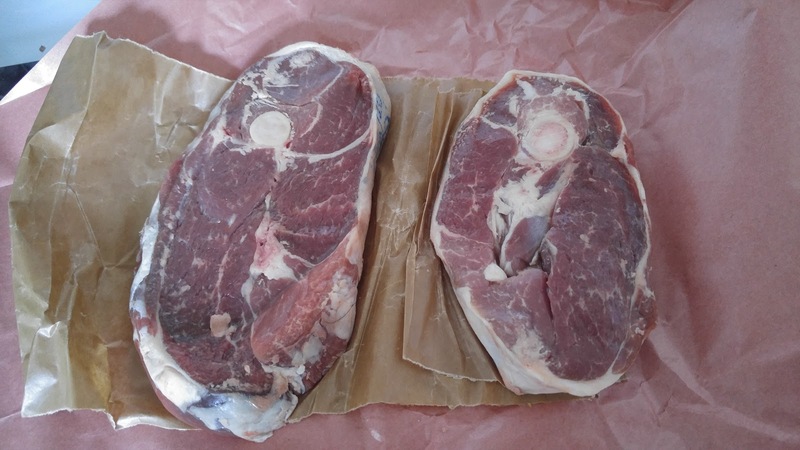 Also, according to Dan, with reverse searing you have less of a "grey zone", (the greyish part between the seared crust outside the meat and the insides) compared to cooking meat straight on the pan or BBQ. 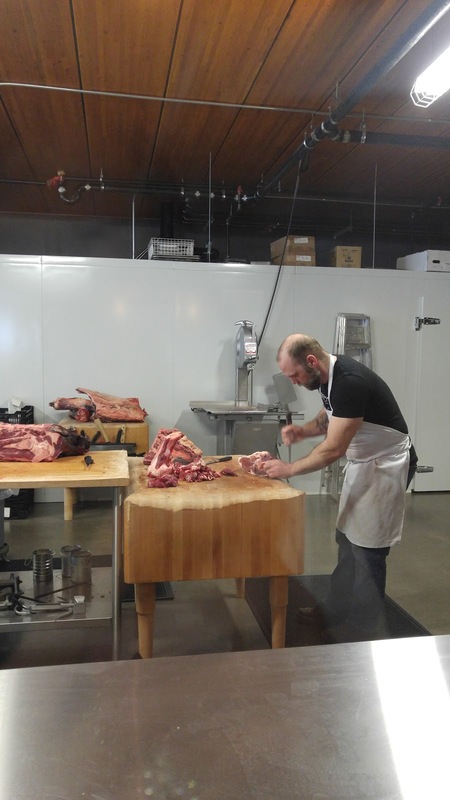 Try to let the meat rest a bit before you enjoy it as it will taste so much better and juicier after some resting! 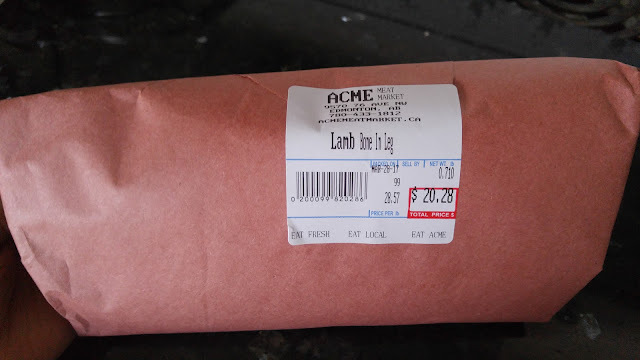 You can also read my last post from 2012 about the meat we get from ACME here. Fridays are when they make sausages so there are lots of handmade sausages to be purchased on Saturday. Make sure you take advantage of how close the market is to Millcreek Ravine and take some time to explore around there too!